MASS shootings at two mosques full of worshippers attending Friday prayers killed 49 people in New Zealand as authorities charged one person, detained three others and defused explosive devices in what appeared to be a carefully planned racist attack. Prime Minister Jacinda Ardern said the events in Christchurch represented “an extraordinary and unprecedented act of violence” and acknowledged many of those affected may be migrants and refugees. In addition to the dead, she said more than 20 people were seriously wounded. Australian Prime Minister Scott Morrison confirmed that one of the four people detained was an Australian-born citizen. The Bangladesh cricket team -- which had been in Christchurch for a test match against New Zealand that was later cancelled -- all escaped without injury. A spokesman said the attack happened as some of players got off a team bus and were about to enter the mosque. “They are safe. But they are mentally shocked. We have asked the team to stay confined in the hotel,” he said. Ardern at a news conference alluded to anti-immigrant sentiment as the possible motive, saying that while many people affected by the shootings may be migrants or refugees “they have chosen to make New Zealand their home, and it is their home. Bush said police had found two improvised explosive devices in one car, a clarification from an earlier statement that there were devices in multiple vehicles. He said they had disabled one and were in the process of disabling the second The deadliest attack occurred at the Masjid Al Noor mosque in central Christchurch at about 1:45 pm. At least 30 people were killed there. Witness Len Peneha said he saw a man dressed in black enter the mosque and then heard dozens of shots, followed by people running from the mosque in terror. Peneha, who lives next door to the mosque, said the gunman ran out of the mosque, dropped what appeared to be a semi-automatic weapon in his driveway, and fled. He said he then went into the mosque to try and help. “I saw dead people everywhere. There were three in the hallway, at the door leading into the mosque, and people inside the mosque,” he said. “It’s unbelievable nutty. I don’t understand how anyone could do this to these people, to anyone. It’s ridiculous.” He said he helped about five people recover in his home. He said one was slightly injured. “I’ve lived next door to this mosque for about five years and the people are great, they’re very friendly,” he said. “I just don’t understand it.” He said the gunman was white and was wearing a helmet with some kind of device on top, giving him a military-type appearance. A video that was apparently livestreamed by the shooter shows the attack in horrifying detail. The gunman spends more than two minutes inside the mosque spraying terrified worshippers with bullets again and again, sometimes re-firing at people he has already cut down. He then walks outside to the street, where he shoots at people on the sidewalk. Children’s screams can be heard in the distance as he returns to his car to get another rifle. The gunman then walks back into the mosque, where there are at least two dozen people lying on the ground. After walking back outside and shooting a woman there, he gets back in his car, where the song “Fire” by English rock band “The Crazy World of Arthur Brown” can be heard blasting from the speakers. The singer bellows, “I am the god of hellfire!” and the gunman drives away. The video then cuts out. There was a second shooting at the Linwood Masjid Mosque that killed at least 10 people. Mark Nichols told the New Zealand Herald he heard about five gunshots and that a Friday prayer-goer returned fire with a rifle or shotgun. Nichols said he saw two injured people being carried out on stretchers past his automotive shop and that both people appeared to be alive. The Police Commissioner warned anybody who was thinking of going to a mosque anywhere in New Zealand on Friday to stay put. The man who claimed responsibility for the shooting said he came to New Zealand only to plan and train for the attack. He said he was not a member of any organisation, but had donated to and interacted with many nationalist groups, though he acted alone and no group ordered the attack. He said the mosques in Christchurch and Linwood would be the targets, as would a third mosque in the town of Ashburton if he could make it there. New Zealand is generally considered to be a welcoming country for immigrants and refugees. Last year, the prime minister announced the country would boost its annual refugee quota from 1,000 to 1,500 starting in 2020. AT LEAST 9 people of nationality or Indian origin are missing after Friday’s shootings at two mosques in New Zealand’s Christchurch left 49 people dead, High Commissioner Sanjiv Kohli said. “As per updates received from sources, there are 9 missing persons of Indian nationality/origin. Official confirmation still awaited. Huge crime against humanity. Our prayers with their families,” Kohli tweeted. The Indian High Commission in New Zealand said that any Indian caught up in the Christchurch mosque massacre and needing assistance could contact it. 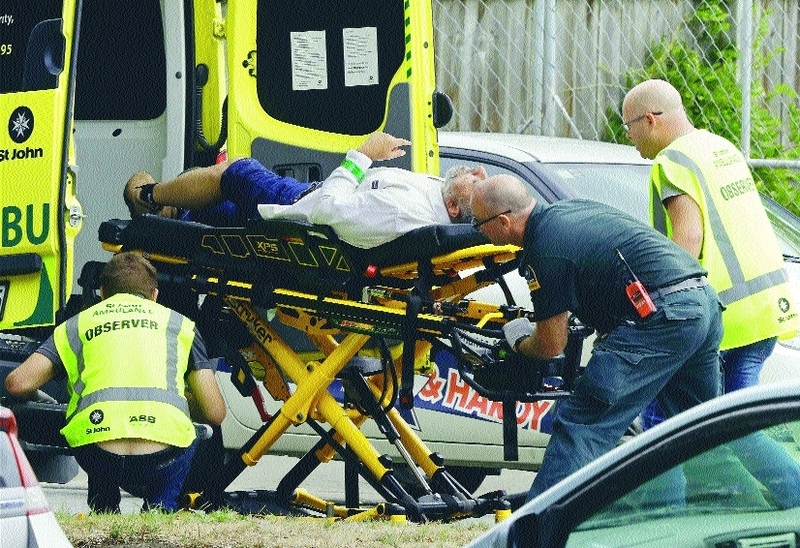 Hyderabad man shot at: A MAN from Hyderabad was among those shot at in the horrific massacre at one of the two mosques in New Zealand’s Christchurch city on Friday. Ahmed Jehangir, who was at Al Noor Mosque for Friday prayers, was injured and taken to hospital, his brother Khursheed Iqbal Jehangir told IANS in Hyderabad. An anxious Khursheed was waiting for more information from New Zealand. He wants to rush to New Zealand to be with his brother and sought help of Hyderabad MP Asaduddin Owaisi. Owaisi tweeted to Foreign Minister Sushma Swaraj and Telangana Chief Minister K Chandrashekhar Rao about the incident. Ahmed’s brother would like to go to New Zealand for his family, Owaisi said. The Majlis-e-Ittehadul Muslimeen (MIM) president requested Sushma Swaraj and Telangana CM to make necessary arrangements for Khursheed’s travel to New Zealand. Telangana Rashtra Samithi (TRS) Working President K T Rama Rao said he would request NRI department to help the family.